Julius Peppers took advantage of the backup offensive line of the Saints and had a huge afternoon. He was dominant against both the run and pass, his day being highlighted by destroying New Orleans’ two-minute drill at the end of the first half with a batted pass, sack and hurry on consecutive plays. Cornerback Donte Jackson missed a tackle early in the first quarter but was otherwise effective stepping up in run support. He also played strong in coverage and generally looked comfortable working out in space for the Panthers today. Making his first start, Kyle Allen had a pretty decent game. He wasn’t spectacular and was errant on a bunch of throws, but he did extend some plays with his athleticism and hit Curtis Samuel with an absolute dime on a throw that traveled 50 yards in the air for his second touchdown of the game. D.J. Moore capped off a very impressive rookie season with another strong game in Week 17. Three of his four catches resulted in a Panthers’ first down and made a spectacular contested catch on a streak down the left sideline with Marshon Lattimore draped all over him in coverage. New Orleans’ defensive line was stout in this one, particularly the trio of Taylor Stallworth, Cameron Jordan and Marcus Davenport. All three of those guys had good games against the run – collecting five stops between them – with Jordan and Davenport also having good games as pass rushers. Missed tackles in the secondary bit the Saints at times. Marcus Williams‘ missed tackle towards the end of the first quarter cost New Orleans a touchdown. The Saints missed five tackles on defense in Week 17, four of those came from the secondary. Dwayne Washington took over for Mark Ingram at running back in the second half and notched over 100 yards on the ground in his limited action. He showed an excellent combination of speed and power and did a better job of setting blocks than he did at times earlier in his career with Detroit. With the offensive line struggling, Teddy Bridgewater had little time to operate in the pocket. He picked up a couple of first downs with his feet but otherwise struggled to find any receivers breaking open in the secondary as plays broke down and was fooled by underneath coverage for an interception in the fourth quarter. 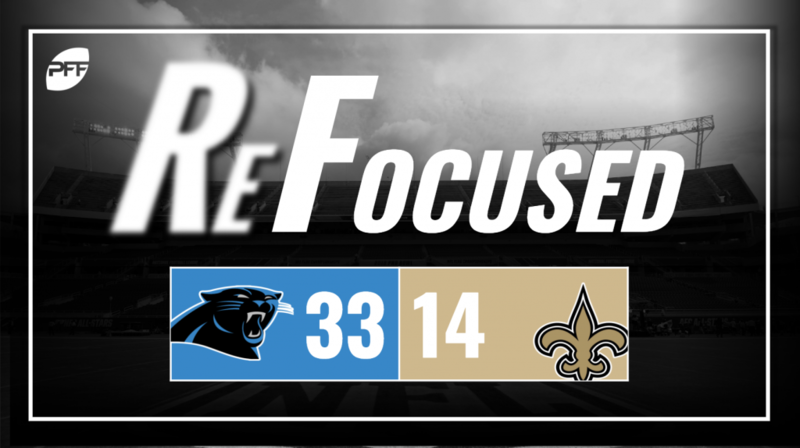 Some key defensive penalties from New Orleans along with some big third and fourth down pickups by Carolina allowed the Panthers’ offense to control this game for the vast majority. Peppers and the Panthers’ defensive line kept the Saints backups off the field for the better part of three quarters of the game.